Prefer a bit more of an icy sensation to ease you into loving a little peppermint and spearmint combination? We know there are a lot of haters when it comes to menthol, but MarkTen is making it their mission to try and convince many that it is not so bad after all. 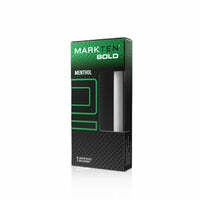 MarkTen include Bold Menthol as an option for a starter kit so that you will not have to ditch the classic icy flavor so soon. This starter kit includes a menthol cartridge that will satisfy your taste buds and make it impossible for you to put down. Are you ready to take a quick trip to the Arctic? When you inhale this flavor, you feel the iciness that comes from the peppermint and the spearmint ingredients used for this cartridge. These two mints are always bickering to see which one will people love more, but they understand they work better as a team. When you breathe out, you feel as if you are going to freeze everything in sight. The long-lasting MarkTen® battery, that is attached to the cartridge, makes this a better experience when it comes to vaping. With a rechargeable battery and a cartridge packed with flavor, it will take a while for you to find the time to put this down. Accompanied by a USB charger, it will make it easier for you to simply allow to continue enjoying the delectable cartridges MarkTen®has to offer.